Sign up for Broadjam today to follow Covita Scelsa Moroney, and be notified when they upload new stuff or update their news! ASCAP member Covita Scelsa Moroney has been a working musician since 1974. She's performed in New England night clubs, Texas Dance Halls, and with the San Antonio Symphony. Moroney studied jazz and composition at Berklee College of Music in Boston, and classical guitar at the U. Massachusetts in Lowell. 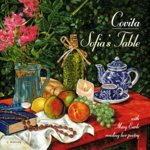 Although she is no stranger to the business, “Sofia’s Table” is Covita's first solo recording. Covita is also the founder of SAVAE, an ensemble with four top-selling early music recordings, including a Billboard-charting WWorld Music release. SAVAE tours, performing the ancient music that has brought the group international regonition for both their artistic performances and exhaustive historical research.